Camping as a form of leisure activity had began to become popular in the late Victorian era. The first holiday camp was the Cunningham Camp for men on the Isle of Man, which opened in 1894. Campers at Cunningham's stayed in tents and conditions were basic. By the early 'twenties, a number of what became known as "pioneer camps" had opened, offering basic accommodation and a genuine camp atmosphere - the holidaymakers joined in with the daily chores of running the camp. The idea of camping and life under canvas was well matched to the inter-war fad for healthy outdoor living. These camps soon became more permanent, with chalets and communal buildings for eating and entertainment replacing canvas. The early entrepreneurs were also joined by trade unions and the Co-operative movement in the camp business, each offering exclusive facilities to their members. The most well known of these being for NALGO members and for civil servants. One of the earliest camps was the Caister Camp which started in 1906. It was originally opened by John Fletcher Dodd as the "Caister Socialist Holiday Camp". Accommodation was in tents and the campers helped out with the chores. After the First World War, chalets replaced the tents. John Fletcher Dodd was still running the Camp in 1951. By then it could accommodate eight hundred in chalets and huts, all with cold running water. The camp also had a licensed bar and provided organised games and sport, as well as trips to the Norfolk Broads. It was situated right on the beach and had over ninety acres of land. 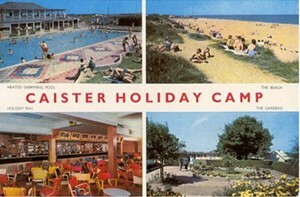 The Caister Holiday Camp is now run by Haven Holidays. Its spirit of friendliness, its setting in the beautiful countryside by the waters of Chichester Harbour, and the bracing Hayling Island climate have given Northney a popularity that has grown with the years. Northney was not the only camp on Hayling Island at that time, there were three other holiday camps in 1951. They included the Civil Service Camp founded in 1924, but now also run by Warners. It was a feature of the holiday camp industry that several camps were often lived cheek by jowl. At Corton, Sufffolk, for example, there were three. The Rogeston Hall Camp run by the Worker's Travel Association, which opened in 1938 included some fine modern architecture; another Civil Service camp which was then (1951) being run by Warners - and in fact still is; and the Corton Beach Holiday Camp which opened in 1933. The philosophy of these pioneer camps was completely at variance with that of Butlin's. The organisers and campers felt that their style of holiday was in tune with the true spirit of camping. "What shall profit a camper if he gain the service of a Grand Hotel and lose the easy camaraderie which made a holiday camp so refreshingly different from anywhere else?" Since Butlin was trying to recreate the atmosphere of the Grand Hotel on a budget, this quote shows just how far apart the two philosophies were. W J Brown, the founder of the Civil Service Clerical Association's holiday camps at Corton and Hayling Island held the view that camps should accommodate no more than five hundred people, beyond that number he considered that it was not possible for a "very rich and full corporate life" to be enjoyed by the campers. Billy Butlin himself found this true when he noticed his very first campers appearing bored and introduced the Red Coats to stimulate this kind of atmosphere. Butlin's did not have the monopoly over modern architecture at camps. On particularly fine example from the pioneer camps is Rogerson Hall at Corton, just North of Lowestoft in Suffolk. This camp was opened by the Workers' Travel Association and was intended to provide cheap holidays, with a reasonable level of comfort to workers and their families. As with Butlin's, the Camp had a modern main building, but its most unusual feature was that its chalets were built in unified blocks, rather than as separate units. This found favour with architectural critics at the time, possibly it was replicating in miniature the conflict between semi-detached suburbia and the council estate. 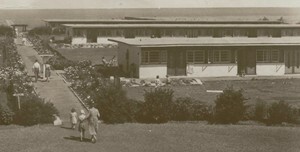 Another strikingly modern camp was built jointly by Thomas Cook with LMS at Prestatyn and opened in 1939. Possibly LMS executives felt LNER's link with Butlin's was losing them business. This camp went one stage further than Butlin's in recreating the atmosphere of the ocean liner - it actually had its own liner deck built on shore, complete with masts and flags, the "Prestatyn Clipper". The Camp was built on the same scale as Butlin's, with its accommodation for one thousand, seven hundred and fifty campers. The Camp buildings were designed by William Hamlyn, architect for LMS. From the entrance between two rectangular shaped columns, between which was suspended the legend "Prestatyn Holiday Camp - The Chalet Village by the Sea" to the white concrete of the main buildings with flat roofs in typical functionalist style, to the swimming pool with its observation tower, the Camp is classic 'thirties style. Possibly the Prestatyn Clipper is a little over the top and lacking in subtlety, compared with such buildings as Embassy Court at Brighton, which only suggests the ocean liner, rather than replicate it, but we must remember that this is a holiday camp where its visitors were permitted to indulge in fantasy for their short stay.